From the National Hurricane Center: ENVIRONMENTAL CONDITIONS ARE EXPECTED TO BECOME MORE CONDUCIVE FOR DEVELOPMENT ON SATURDAY OR SUNDAY…AND THIS SYSTEM HAS A HIGH CHANCE…80 PERCENT…OF BECOMING A TROPICAL OR SUBTROPICAL CYCLONE DURING THE NEXT 48 HOURS. The Hurricane Season doesn’t begin until next week. We’ve already had Alberto. Now we might be getting Beryl. As I wrote during Alberto, there’s a reason we don’t usually get tropical systems this time of year. When conditions are conducive for intensification they’re only marginally conducive and only in a very small area. 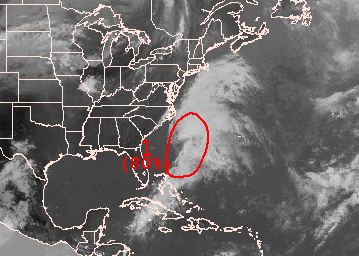 Unfortunately one of the long range computer models brings Beryl up-the-coast by next Friday. Long range forecasting of tropical systems is notoriously poor. I’ll keep my eye on it. I’m glad you’re on the job last summer’s tropical storm sucked wind in more ways than one way !! !